On an area of ​​about 65 m2, the house is composed of 3 rooms: a living room, a kitchen, a bedroom, bathroom and bathroom, 2 toilets. The dishes are of quality, the linen and towels are provided as well as all the household products without any supplement. A washing machine is at your disposal as well as a steamer. You will thus benefit from all the modern conveniences necessary to spend a very pleasant stay in an old house. A crib will be added to your room to accommodate your baby. The cottage is located on a plot of 1.7 hectares of park and meadow occupied by a mare and a donkey. The salt pool 10x5, is available in a rural setting with views of the vineyards. It is to share with the owners. garden furniture will allow you to take your meals outside, on your terrace equipped with a barbecue. The terrace is exposed to the west. After agreement, your pet is welcome at our place. In case of special needs, please let us know before your arrival. We are at your disposal to inform you during your stay. Rentals from June to the end of September are from Saturday to Saturday. See you soon ! 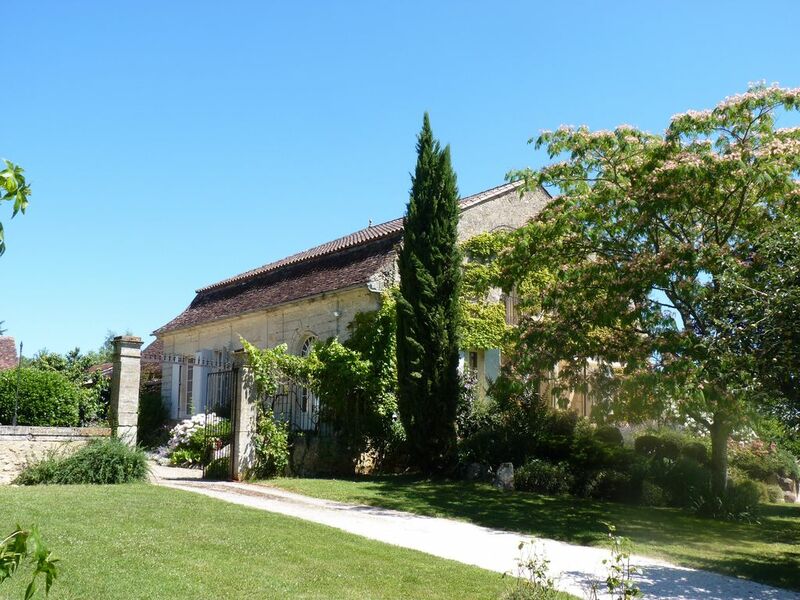 An historic and characterful property set in the vineyards of The Grand Jaure. A superb location, the property dating from the late 18th century is set in peaceful gardens with a large swimming pool surrounded by vineyards yet just a few miles from historic Bergerac. Well placed for easy access to Perigueux and the Dordogne valley with its many chateaux and historic villages and Bastides, the Gite du Grand Jaure is the perfect place to unwind and relax in its tranquillity whilst enjoying the food, wines and history of this beautiful region of France. We were welcomed by Pascale, our host, with figs and grapes from her garden together with a bottle of their own estate produced wine. Although the gite adjoins the owners accommodation they were not intrusive but we were pleased that they would be available if needed. Thank you very much Ritsa and Roger for this kind comment. But I have to specify that the white wine (called Rosette) you found in the fridge comes from my neighbors'vineyards. I am not the owner even if they are close to us and have the same name. Grand Jaure is the name of this place. Nice to meet you again, with or without a jazz concert ! The gite, is comfortable and full of history. It is nestled between the property of the owners and neighbour but you feel relaxed and private with full access to the beautiful gardens and fabulous pool. The gite is more than comfortable. The owners cannot be more supportive, kind and welcoming whilst respecting your space. It is fabulously sitated between Bergerac and Lembras, the latter has a small grocery store, boulangerie and access to a beautifully peaceful dog walk on the river Caudeau. A wonderful find. Merci beaucoup Ros pour cette appréciation concernant votre séjour au Gîte du grand Jaure. Nous avons été heureux de faire votre connaissance avec Claire et sommes très contents de savoir que vous avez appréciés vos 2 semaines de séjour dans ce cadre typiquement périgourdin que nous aimons tant. Couldn’t fault the very peaceful setting overlooking a vineyard. Surroundings, architecture and gite made the stay memorable. Pool was lovely and had long views over the vineyard. Location was ideal for discovering the Dordogne by both cycle and kayak. If you want to get away from it all but still be in easy reach of Bergerac, restaurants and all that the Dordogne region has to offer then this gite will provide a wonderful holiday home. Thank you very much for this nice opinion. Comfortable house in a beautiful setting. South of the Dordogne, Gite du Grand jaure is about 5km from the historic center of Bergerac and 5 minutes drive from the shops. I stand at your disposal to help you in your choice of visit. You will find there the tourist literature and my Facebook page will inform you of the tourist and cultural news of the moment in Bergerac. hors période estivale, possibilité de location du gite moins d'une semaine merci de nous consulter pour les tarifs.